I've seen very few woolly bears sauntering around southwest Ohio thus far this fall; until yesterday. I spotted a noticeable number crossing a road or becoming laminated onto tires while I was driving on a roadway near my home. Of course, mine is a less-than-scientific observation; it's difficult making an accurate caterpillar count while driving at highway speeds. I'm not sure why I've seen far fewer woolly bears thus far this season compared to previous years in southwest Ohio. Perhaps populations are simply low this year. It is common for native insects to demonstrate wide swings in numbers from year-to-year. It may also be associated with our unusual late-summer weather with the extended number of cool days stretching out caterpillar development. Maybe their crawl-abouts have been delayed. Or, it could be a combination of all of the above. Woolly bears (woolly worms in the south) are the caterpillar stage of medium sized moths known as tiger moths (family Erebidae; subfamily Arctiinae). The caterpillars are so-named because of their short, stiff bristles. The sharp-pointed bristles (urticating hairs) serve to defend the caterpillars; however, they are not stinging hairs. Still, some people suffer severe localized reactions if the hairs penetrate their skin. Woolly bears will roll themselves into a tight ball when disturbed to bring to bear their defensive bristles. It also makes them look like a hedgehog which is referenced by the common name of hedgehog caterpillar. 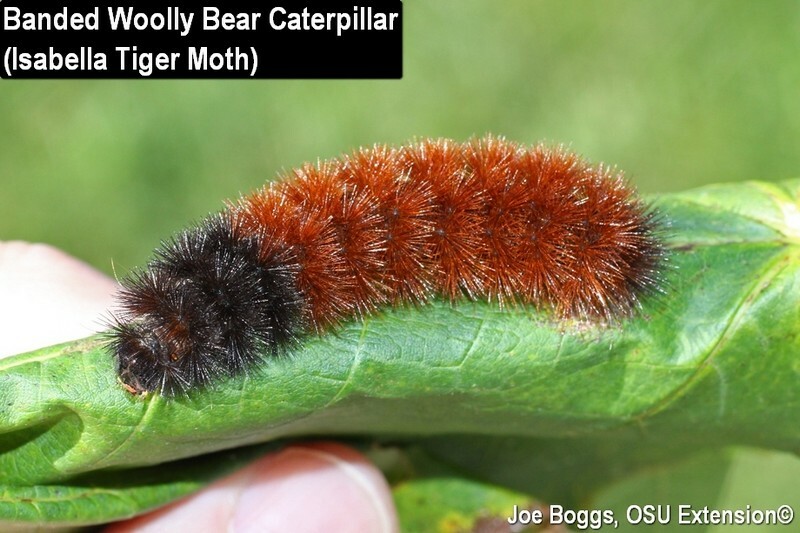 Four of the most common woolly bear species found in Ohio are the banded woolly bear which develops into the Isabella tiger moth (Pyrrharctia isabella); the yellow woolly bear which develops into the Virginia tiger moth (Spilosoma virginica); the salt marsh caterpillar which develops into the salt marsh moth (Estigmene acrea); and the giant leopard moth caterpillar (Hypercompe scribonia). The caterpillars of all four species may be found feeding on a wide range of plants including some field crops. These moths have two generations per season in Ohio with the largest number of caterpillars occurring in the second generation. This is one reason we typically see more caterpillars in the fall. Of course, the other reason is their mass fall crawl-abouts in search of protected winter quarters. The banded woolly bear is the species most often referenced as a predictor of winter weather. According to folklore, the total amount of black on the woolly bear in the fall predicts the severity of the upcoming winter: the greater the amount of black, the more severe the winter weather. Also, the position of the widest dark bands predicts which part of the winter will be the coldest. If the dark band is widest at the head end, the beginning of winter will be severe. If the dark band is widest at the tail end of the caterpillar, winter will go out like a lion. The predictive ability of the caterpillars is further fine-tuned by "reading" the 13 segments of the caterpillar's body which are said to correspond to the 13 weeks of winter. Researchers have debunked the weather prediction folklore by showing the amount of black varies with how long the caterpillars have been feeding and the moisture levels in the area where they develop. Of course, caterpillar coloration also varies between woolly worm species. If weather prognosticators use the "yellow color-form" of the yellow woolly bear, they would assume there will be no winter. Conversely, the all-black giant leopard moth caterpillars could create mass panic causing folklorists to flee to the south for the winter! Regardless, I'm now on the lookout for woolly bears. Maybe numbers are down, or mass migrations haven't occurred yet, or I've simply missed the migration by driving on woolly bear-less roads. Drop me a note if you're seeing large numbers of woolly bears; but drive carefully and remember to check your tires for laminated specimens.